Easy to Handle—Therminol VP-3 has a normal boiling point of 243°C (469°F), 14°C (26°F) below the normal boiling point of Therminol VP-1. Laboratory thermal stability testing suggests a maximum continuous operating temperature of 330°C (625°F) in the liquid or vapor phase. 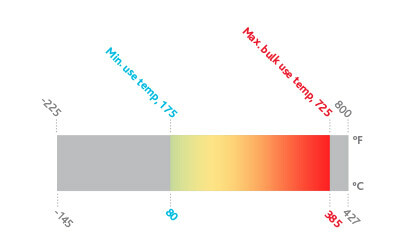 A crystallization point of 2°C (36°F) makes Therminol VP-3 easy to handle and may eliminate the need for costly heat tracing in moderate climates. Low Odor—The odor of Therminol VP-3 is milder than other vapor phase organic heat transfer fluids. Therminol VP-3 is a mixture of phenylcyclohexane and bicyclohexyl. It contains virtually no biphenyl. Class III b Combustibility—With an open cup flash point of 104°C (219°F), Therminol VP-3 is a Class III b combustible fluid under the definitions of the (U.S. National Fire Prevention Association) NFPA . As with any other combustible material, proper system design and operation are important to safe operation. Leaks of vapor could condense into a stable mist suspension that may be explosive in certain concentrations in air.